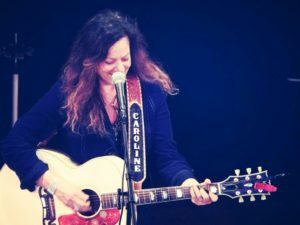 Caroline Doctorow has been called a great champion of folk music, and her velveteen voice recalls the great folksingers of the ’60s. Her most recent album “Dreaming in Vinyl” reached #2 on the folk radio airplay charts. This year she received the Alexander Award for educating through art, and an Official New York State Proclamation from State Senator John E. Brooks, honoring her many years of work as a folksinger. She will appear next year in the Christopher Lucas film “If I Had a Hammer” along with Taj Mahal, Guy Davis, Dar Williams, John Cohen and others to celebrate Pete Seeger’s legacy and 100th birthday. In addition to eleven solo albums, she released the first retrospective of the work of ’60s folk icons Richard and Mimi Fariña titled Another Country which received critical acclaim. Her songs and her voice have been heard on soundtracks on the large and small screen. She is the daughter of the late world-renowned author E.L. Doctorow.